Right brain, left brain integration is a topic many people are familiar with, but another way to explore brain integration is by thinking about one’s “upstairs” and “downstairs” brain. 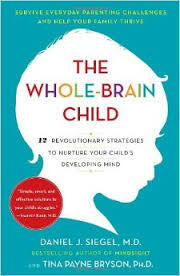 This idea was coined by Dr. Dan Siegel and Dr. Tina Payne Bryson, co-authors of the book, The Whole Brain Child. This book bridges the amazing advances in neuroscience to the arena of raising children, encouraging readers to help children integrate the different parts of their brain to enhance their well-being. According to the model, the downstairs brain is made up of the limbic system, amygdala and mid brain. One role of the “downstairs” brain is simply to respond to emergencies, exhibited by the fight or flight behavior found in humans and animals. The upstairs brain is made up of the cerebral cortex and is responsible for the rational thinking, and sound decision making. Much of this part of the brain is still under construction in children, with the prefrontal cortex nearing its completion of development at the shocking age of about 22 years! Adults also exhibit upstairs and downstairs behavior. If you have ever witnessed an adult engaged in road rage, or rescuing someone from a burning building, this is a person who is using their downstairs brain to react to some type of stimuli perceived as dangerous. When adults deal with conflict in a rational and calm way, this is an example of engaging their upstairs brain to deal with stimuli. Increasingly, we seem to be living in a time saturated with a lot of “downstairs” brain behavior. Global statistics report that the human race is currently engaged in 41 wars at the moment of this writing. It seems unlikely that many of these conflicts will die down soon, so the best way to bring more dignity to our species is to explore our own “upstairs and downstairs” behavior. Can you think of a time that you engaged in “downstairs” behavior? Please take a pen and paper and create a comic strip about this incident (stick figures are great if you are not artistically inclined). Please include word balloons to identify the conversation. Once you have drawn this, please go back into the cartoon and write what you should have said to improve the situation or the final outcome of the situation. Most likely, the difference between how you behaved and how you wish you would have behaved might parallel the amount of guilt or shame you feel toward the incident. The good news is that thinking about this behavior can actually improve future conflict so that you will engage your upstairs brain in future conflicts. Can you go back to the person with whom you had a conflict and apologize or make amends? We probably cannot bring peace to the many, many corners of the world engaged in war, but we can start to bring peace to the world one relationship at a time. Happy integrating! Make our species excellent today!